You can resize the Sidebar to be smaller or larger, depending on your screen size and your preference for how much of the Sidebar content you want to see. You can also collapse the Sidebar to the minimum width if you don't need to it while you're working. 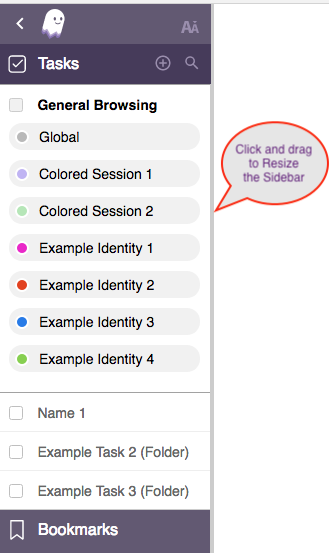 Hover your mouse over the border where the Sidebar meets the web page. A double-sided arrow will appear to indicate that you can resize the Sidebar. Click and drag the Sidebar to change the width. In the expanded view, click on the left-pointing arrow icon to the left of the Ghost Browser logo at the top of the Sidebar. In the Collapsed view, click the right-pointing arrow at the top of the Sidebar. 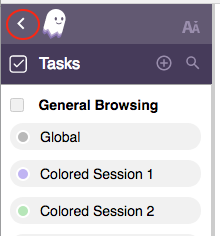 To access Ghost Browser's settings click the Browser Settings heading in the Sidebar. From here you can access all of Ghost Browser's settings. More information on managing Ghost Browser's Settings. 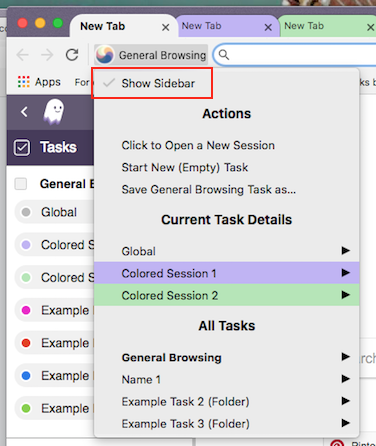 In Ghost Browser 2.0 we've designed a more productive way for you to manage your tabs with a Sidebar. It takes the tab, Session and Project management features of the previous versions' Ghost Menu to a whole new level. If you're having trouble getting used to the Sidebar, we've provided you with a way to switch between the Ghost Menu and the Ghost Browser 2.0 Sidebar. This setting won't always be there, so we highly encourage you to play with the Sidebar and explore the many productivity-boosting features it provides. Click the Ghost Menu to the left of the address bar. Check or un-check Show Sidebar. This will toggle new Sidebar open and closed. If you un-check the Show sidebar setting you can use the Ghost Menu to manage Sessions and Workspaces.